Posted by Dave Emory ⋅ December 4, 2014Post a comment Email This Post Print This Post Tweet This! NB: This description contains material not included in the original broadcast. Introduction: The U.S. was one of three countries to vote against a U.N. resolution condemning the celebration of Nazi collaborators as “freedom fighters”–something the U.S. has been promoting since the end of World War II. Germany and the EU nations abstained. Ukraine itself and Canada were the other countries that voted against the resolution. The OUN/B diaspora and its influence in the GOP and intelligence services of the U.S. is the primary consideration to be weighed in connection with this disgraceful episode. The large OUN/B diaspora population in Canada undoubtedly has much to do with that nation’s behavior in this context. In this article, Eliason analyzes the role of the OUN/B diaspora and its pivotal role in the generation and propagation of anti-Soviet and anti-Russian ideology. By working within networks such as the Promethean League, the Anti-Bolshevik Bloc of Nations and other intelligence-connected networks, the “Bandera” have successfully commandeered the ideological, political and journalistic attitudes and policies pursued by the countries that hosted them. Fol­low­ing the anti-Russian “lus­tra­tion” laws, Petro Poroshenko is moving to alter the cit­i­zen­ship laws to allow select for­eign­ers to get fast-tracked cit­i­zen­ship in order to allow them to hold cab­i­net posi­tions. It sounds like he’s also con­sid­er­ing just allow­ing for­eign­ers to fill those posts with­out the cit­i­zen­ship require­ment. It sounds as if he wishes to install personnel from the OUN/B diaspora in Ukraine’s law enforcement and national security apparatus. Program Highlights Include: British intelligence officer Brian Crozier’s role in the immersion of Bandera in the intelligence services and political establishments of the UK and other European countries ; review of the Free Congress Foundation’s role in installing the “Bandera” and other Eastern European Nazi collaborators in newly-liberated countries of the former Soviet bloc; discussion of Simon Petliura’s establishment of fascism as the template for Ukrainian nationalism; the influence of the Austro-Hungarian Empire on the development of fascism in Ukraine and other Eastern European nations. Today with the support of Europe, Australia, Canada, the US directly, NGOs, the IMF and UN indirectly; Kiev enjoys an unparalleled geopolitical position. Whatever lie it tells is the new truth. Commentators have been scrambling to make sense of this, and of how Nazism could have popped up so boldly with the support of the free Western World. We’re told it only plays a small part in what is going on in Ukraine, but history is often stranger than fiction and in this case fiction is the story you have been told. Ukraine is a paradox: There has never been a democratic oriented government in Kiev and democratic protests were the ruse to get Western support. From the late 1980’s to Ukraine’s independence in 1991, the Bandera world leaders looked at Ukraine sensing independence would soon happen. Their greatest concern in the run up to freedom was that there were no Nazis in Ukraine, or more precisely only a few, located around the Bandera capital of Lviv, with no political power. From 1991, with the help of the US and EU they have been preparing to change that fact radically. The paradox is that modern Ukraine’s Nazi governments have always been active on the world stage. The only form of government the modern Ukrainian state has ever known has been the worlds longest continuing and most extreme ultra nationalist government the planet has ever seen. In 1848 the modern Ukrainian state came into being under the Austro-Hungarian (Hapsburg) Empire, in what is called the Spring of Nations ( see Roots of Ukrainian Nationalism -Paul Robert Magosci). Under the Hapsburg empire the Ukrainian people were first recognized as a distinct nationality and freed from the serfdom they had been under since the seat of the Rus empire moved from Kiev to Moscow. In the Austria-Hungarian Empire they were known as the Tyroleans of the east. The term means Austrians of the east. With their recognition as a people by Vienna, they acquired the Habsburg model of government. These countries include: Galicia (West Ukraine), Ruthenia ( West Ukraine), Estonia, Poland, Latvia, Lithuania, Austria, Hungary. After WW I Germany adopted this model, as did Bosnia-Hercegovina, Serbia, Slovenia, and Romania. When fleshed out, this government model is an extreme form of ultra nationalism. The only part of Ukraine recognized by the empire was Galicia which was a major holding for the Hapsburgs. Linguistically there were four languages in what is now Ukraine. Ruthenians, also called Russyns, had a unique language. Galicia had its own, which is now called Ukrainian. Dnieper Ukraine spoke a similar language. People in Little Russia (the South East), which was outside of the Hapsburg holdings spoke Russian and were a part of Greater Russia. (ibid). Western Ukraine was entirely devoted to the Austro- Hungarian empire and was its staunchest supporter in war. The ultra nationalist government model that the Austro-Hungarian Empire set out for the individual nations in the empire during the 1848 Spring of Nations set up a dual loyalty system that bound the countries inside the Empire to Vienna’s rule. Each country weeded out citizens that lacked total loyalty to the empire’s ultra national patriotism, or considered other forms of governance. They did this through pogroms and genocide. Each citizen’s identity had to wrap around the exceptionalism as defined by the leaders of their country. Each citizen was first and foremost entirely devoted to the nation, demonstrated by national sacrifice or heroism. To be entirely devoted to nation involved an almost cultic devotion to the Emperor and the Empire that the nation was part of, and belonged to, and Galician Ukraine became the Austro-Hungarian Empire’s poster child. Ultra nationalism shielded Hapsburg West Ukraine from Russian influence outside and from Polish influence inside. It kept all of the Empire’s possessions from gaining too much influence in sister countries and competing for loyalties. This would be achieved by helping these nations to develop along strong ultra nationalist lines. All the Promethean countries agreed to put any disputes behind them and work together until they were all free ultra nationalist states. For Ukraine from its inception as a recognized people in 1848, Nazism is the only form of government it has ever known. The short lived governments that followed and continued in exile all these years were known for their unrelenting brutality and extreme ultra national characteristics. All ultra-nationalism functions by focusing on a national myth. This means that history and reality are irrelevant. The myth creates the nation that can do no wrong and is set above morality. The root of Galician hatred of Russia is based in its national myth. According to this myth they are the sole heirs to Kiev Rus the forerunner of their nation. They are the heirs of the language, and the rightful rulers of all Rus people. According to the myth, the Moscovy empire stole their birthright and language. This is what prompted the 2014 Moskal on the knives murderous rage that is part and parcel of Ukrainian nationalism. At the same time they point out that they were called Ukrainians and spoke the Ukrainian language in the days of Kievan Rus to justify the nationalist myth that language is what binds them (History of Ukraine- Rev. Isadore Nahayewsky, PHD- America Publishing House of the Providence Association of Ukrainian Catholics in America 1962). The nationalist myth is a common denominator in every ultra nationalist or nazi country. In the case of Ukrainians, they consider that they have been done an irreparable wrong by history, and the only way to right it is to destroy Russia. From 1917 to 1921 Ukraine existed as three independent states; Western Ukraine, Ukraine, and the Donetsk–Krivoy Rog Soviet Republic (disbanded 1918 and integrated with Soviet Ukraine). During this time, no Ukrainian government lasted more than a year before being overthrown by increasingly ultra nationalists; however, the Southeastern region was never a part of ultra national Ukraine. The government of West Ukraine (Galicia) and Ukraine formed a loose mainly symbolic union based on ultra nationalism. Each had its own national government, army, and laws. Simon Petliura was one of the original leaders of the Hapsburg countries to sign onto Prometheanism. But even as the recognized dictator of Ukraine he was forced to move the government into exile.The only acceptable form of government to a Ukrainian is the Galician (West Ukraine) model of extreme ultra-nationalism. Petliura is revered as a hero in Western Ukraine and a butcher everywhere else for his pogroms, torture, and murder. As the Soviet Union grew stronger, Poland set up what it and eventually the West would consider the only legitimate governments of the Promethean countries. Eventually, with the addition of a few more anti-bolshevik countries (in exile) they would be looked upon as a mini- UN by the west. The common denominators were that all are extremely ultra nationalist and all have a common hatred for Russia. Prometheanism is still very active today, focusing on destroying the perceived Russian imperialism. ** Note:With this development, unless otherwise specified, Bandera is used as a generic term which, like its synonym Nazi, should be used as a group description for all “in exile” governments under direct Bandera leadership. All of the above listed have been. 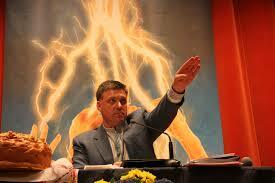 History dealt another real slight to ultra nationalist Ukraine by crediting the rise of Nazism to Adolf Hitler. After WWI Germany also moved into the Hapsburg model of independent governance. Hitler wasn’t original, he just developed into the big kid on the block. Nazi Germany had little use for Nazi Ukraine until after the war started. German Nazi ideology was based on industrial fascism, while Ukrainian ideology was based on agricultural fascism. Ukraine was seen as a backwater to the German ultra nationalists at the time, and this hasn’t changed. Following the WWI breakup of the Austria-Hungary Empire the Bandera were an ideal fit. The Germans were the sister empire to their own and they expected the same kind of treatment. That fact made it natural for the Bandera to swear allegeance to the Third Reich forever. It was a slap in the face when they didn’t get the same rights they had under the Empire. This fact, coupled with Hitler losing the war are the only reasons they hate being called Nazis today. It’s also why in some of the private armies operating in Ukraine today they swear allegiance to the 3rd Reich ideal. Anyone who has followed Ukraine at all is well aware of Bandera’s activities in WWII. The genocide of over 500,000 people in Ukraine, the SS Divisions that the ultra nationalists manned, fighting against both the Soviet Union and the Western Allies. The Bandera SS Divisions also manned the concentration camps that became extermination camps during the war. The Bandera have never stood trial for crimes against humanity, and never even had to apologize. In 1946, three developments happened that profoundly changed the world we live in. The first happened as the ultra nationalist Ukrainian emigre populations settled into their host countries and started to participate as dual citizens. Keep in mind that other than for a few brief years, Ukrainian ultra nationalism only existed as a government in the diaspora. The first the Ultra Nationalists were political extremists from a tiny region and afterward only existed as a standing army. During and after WWII, the Bandera army moved out of Ukraine, emigrating as a nazi army to host countries all over Europe, Scandinavia, Australia, and further West. The Bandera were comprised of, at minimum, 4 Waffen SS divisions as well as the large civilian army they maintained for genocide. The Bandera started taking public office as citizens of the host country and maintained representation in the Ukrainian government in exile. They joined political parties and pushed the host countries political ideologies toward the far right as they went. They worked together as a bloc to push for the destruction of the Soviet Union and the reinstatement of a government that would become Nazi Ukraine. Eventually, as office holders or advisers they were in position to push Bandera’s objectives in conjunction with the government in exile. The other Bandera (all associated groups) described under the Promethean project and below did the same thing, working hand in hand with the Ukrainian leadership. Eventually this mix dominated all of Western politics, especially the conservative and ultra liberal parties whereever they went by stoking nationalist fervor and pride – or Exceptionalism. After 1947 they were recruited as agents in the cold war. Eventually across Europe and the West they would run the cold war and gain access to the highest positions of power on the continent. Stetsko was Stepan Bandera’s second in command and founder of many of the groups that would push for Ukrainian independence. Stetsko took over world leadership of Bandera’s OUN-B faction in the late 1960’s until 1986 when he died. He was never charged with crimes against humanity. ***The Anti-Bolshevik Bloc of Nations was a group of extreme ultra nationalist Eastern European countries whose purpose was the destruction of the Soviet Union and Communism by furthering the Promethean project’s aims. ABN countries were developed on ultra nationalist foundations, and their acceptance across the west was due to their work during the cold war. Propagandists that could communicate with people inside their respective bloc countries and disseminate anti Soviet propaganda to the local populations, building nationalist tensions. NATO actionable intelligence: Bandera has been described as the only weapon needed to destroy the Soviet Union. This was due to its ability to infiltrate governments, influence policy makers, and get their own people into positions of power. When Symon Petliura (president of the government in exile) was assassinated in 1926, Andrii Livytsky took over. In 1945 Livytsky reactivated the Government-in-exile of the Ukrainian National Republic and invited representatives of the new emigration to join it. In 1946 he instructed Isaak Mazepa to unite all political parties around the state center of the UNR, and that union eventually resulted in the organization of the Ukrainian National Council (1947). In 1945, at the founding of the United Nations, the Ukrainian Soviet Socialist Republic was given founding member status. Eventually through the work of the ABN, UNC, and many other Bandera (include all captive nation countries under ABN), the UNC stepped into this position unofficially. Eventually all factions of the Ukrainian Diaspora would coalesce around the UNC and the government in exile of Ukraine. By the 1980’s the Ukrainian National Republic government in exile became the only representation of a free Ukraine for Europe, the West, and its allies. The Soviet Union that the world heard about during the Cold War until its collapse was the propaganda the Bandera developed about Stalinism. In January 1950, the Soviet Union offered a general amnesty to all Bandera fighters. During the 1950’s the Soviets pushed out the last of the Bandera guerilla fighters and after Stalin the Soviets went through a period of de-Stalinization. This normalization made possible Bandera’s resurgence in Ukraine. Normalization (or Sovietification) meant taking all the different republics in the Soviet Union and homogenizing them in order create one nation. Part of that effort was to whitewash the Ukrainian Nazis from the history books, both to assimilate and protect primarily the Galician population that was left, from retribution for the genocide Bandera committed in west, central, and eastern Ukraine. Because Nazism wasn’t taught in school beyond the fact that it is evil, what Ukrainian ultra nationalism is was forgotten. Most survivors of the atrocities just did not talk about it. Thus, in the 1990’s, ultra nationalism could emerge and remain unrecognized in plain sight, growing into the organizational force behind the Orange Revolution and the Coup in 2014. All the pro-coup forces present in 2014 including Tryzub/ Pravy Sektor were active in 1991. In the late 1940’s and into the 50’s cold war fever spread across Europe. Governments began their move to the right and eventually far right, culminating in the UK with Prime Minister Margaret Thatcher. Communist sympathizers in government were ferreted out. Anti- Communist groups such as the ABN became the go to networks for intelligence and sabotage efforts. During the 50’s, Stetsko’s ABN absorbed or destroyed every other group or network not previously aligned with it, and became the sole provider of intelligence to all of Europe’s intel agencies and governments regarding the Soviet threat. These were the only Eastern European government structures that Europe ever dealt with for over 50 years. During this time, European defense and foreign policy revolved around what their Bandera partners reported. When you consider everything that occurred during the Cold War, that is considerable. From the late 1940’s until the fall of the Soviet Union in 1991, MI5 (British Intelligence) dealt exclusively with Bandera groups. Europe was introduced to all the various governments in exile and especially the Ukrainian. These are the only Eastern European partners Europe ever knew. During this period it became the policy of Western European countries to help free the captive Soviet bloc nations, support the governments in exile’ claims to legitimacy and protect their rights. The Hapsburg monarchy helped guide the leadership in their former possessions. The Freedom Council was formed by Otto von Hapsburg and Yaroslav Stetsko at a conference in Munich on June 30-July 2 1967, as a coordinating body for organizations fighting communism in Europe. EMP H.R.H. Otto von Hapsburg was honorary chairman of the European Freedom Council, based in Munich, during the 1980s and allied to the Anti-Bolshevik Bloc of Nations (ABN). The EFC was founded in 1967 and in 1987 celebrated its 20th anniversary. The Executive President at that time was British M.P Mr. John Wilkinson, and one of two Vice-Presidents was Mrs. Slava Stetsko, M.A. (ABN). corresponded regularly. The EFC functioned as ABN”s Western counterpart and sought to “mobilize support of the Free World for the subjugated nations'” liberation struggle.”A mass Western mobilization in support of ABN”s disenfranchised delegates could only strengthen the united multi-national ABN front”. The administrative structure of EFC resembled that of ABN, and the EFC represented anti-communist groups from Austria, Belgium, Canada, Denmark, England, France, West Germany, Holland, Italy, Spain, Sweden, Turkey, and the United States. The EFC extended into Asia with the Asian-Pacific Anti-Communist League, that included Afghanistan, Saudi Arabia, China (Taiwan), Thailand, and Vietnam. (Eastern European unity under Russian Communism and the Anti-Bolshevik Block of Nations: Conception, Ideology, and Conferences by Alexander Nicholas Sosoenko). The EFC further institutionalized and legitimized the ABN groups under Stetsko. All of the anti-communist working groups in every country were tied directly into the respective intelligence services and foreign policy dealing with the Soviet Union. This enhanced their standing and made their support part of national policy across Europe. How important were they? Slava Stetsko is the only major WWII Nazi figure to ever hold high national office anywhere in the world. She had the support of a united Europe behind her. She was awarded the medal of Freedom in the US. The EFC gave her almost immediate access to all the European heads of state, and in Britain the full support of Margaret Thatcher’s Conservative Party. Brian Crozier and the Institute for the Study of Conflict (ISC) brought the influence Stetsko’s ABN groups had in the UK to a peak under Margaret Thatcher. Crozier was a constant fixture lecturing at the Ministry of Defense about the communist threat. His view of it was exactly that of the ABN. Detente was weakness. The Soviet Union had to be dismantled. In 1991 it was. The Promethianism project started over a hundred years ago, building an ultra nationalist Ukraine and Eastern Europe as a buffer to Russia. It’s called the Intermarium. The formation of the renewed Baltic-Black Sea region, or the Intermarium, started in the 1990s. In 1993, US Presidential National Security Adviser Anthony Lake proclaimed the concept of expanding democracy. It provided for the involvement of former Eastern bloc countries and Soviet republics, save Russia, in Transatlantic institutions. The Clinton Administration launched NATO’s eastward expansion in 1994 with a view to its implementation. The Kremlin adamantly objected to this policy. When you look honestly at the fruit of the Hapsburg Spring of Nations, Prometheanism, and the European and US supported Bandera, its really staggering. Ukraine is only in the spotlight because it was the only place where regime change could come quickly. Many of the East European countries in the EU and NATO are already Nazi, or are implementing the political groundwork for the establishment of ultra national governance. Galicia (West Ukraine), Ruthenia ( West Ukraine), Estonia, Poland, Latvia, Lithuania, Austria, Hungary, Post WW I Germany, Bosnia, Hercegovina, Serbia Croatia, Slovenia and Romania stepped into this model. The problem with these examples is that they are not cultural exceptions, but the rule. In 2007 at Tbilisi, Georgia, a statue of Prometheus was dedicated by Georgian President Mikheil Saakashvili and Polish President Lech Kaczynski. Saakashvili has shown by his militant support for Nazi Kiev that he is a true believer in Prometheamism’s ultra nationalism. Before 1991, Ukraine was part of the Soviet Union, but from the West’s perspective where were the Ukrainians? More importantly, who were the Ukrainians? The Ukrainian National Republic had existed outside Ukraine for over 80 years. It was a friend to the West and its people were the Ukrainians. People inside Soviet Ukraine were Soviet citizens, unless they were working with the Bandera operatives. Europe never met them. Europe never knew them. Europe did not and does not recognize the indigenous people of Ukraine unless they are given the stamp of approval by their longtime friend – the Ukrainian Emigre Population’s leadership. In 1991 the president of the Ukrainian National Republic gave his power and the seal of state to Leonid Kuchma who until then had been a communist leader in Kiev. Kuchma was born in Galicia, Poland (Ukraine), and was for his entire life a Ukrainian ultra nationalist. In accepting the seal, the flag of Galicia (Bandera) Kuchma agreed to bring the new state in line with the law and tradition of the Ukrainian National Republic circa 1919. In 2014 that is what finally happened. That was what Maidan was about. When Poroshenko gave his inaugural address he paid homage to this fact. He said that the wars of 1917-1920 had finally been won. This was acknowledged by his election. This new Ukraine was now under the laws and traditions of 1920’s Ukraine as demanded by Symeon Petliura. This was finally the Ukraine they had been waiting for. Today ultra nationalist Ukraine makes that clear by this genocidal war through which Kiev is choosing its citizens. Why doesn’t Europe see or hear the Donbass Genocide? Europe can’t see Ukrainians being murdered or tortured, bombed or gassed, hacked with axes or beaten with stones because their longtime friend and ally assures them they would not do that to their own citizens- the Ukrainians. In Europe’s view the people in Donbass are an old Soviet relic that never represented Ukraine and needs to go away. Donbass was never a part of the Ukraine they know – then or now. 2. The U.S. was one of three countries to vote against a U.N. resolution condemning the celebration of Nazi collaborators as “freedom fighters”–something the U.S. has been promoting since the end of World War II. Germany and the EU nations abstained. Ukraine itself and Canada were the other countries that voted against the resolution. The OUN/B diaspora and its influence in the GOP and intelligence services of the U.S. is the primary consideration to be weighed in connection with this disgraceful episode. The Federal Republic of Germany has refused to vote in favor of a United Nations resolution condemning the glorification of National Socialism and Nazi collaboration. Last week, the Third Committee of the UN General Assembly passed a resolution strongly criticizing the edification of memorials to Nazi functionaries and the stylization of Nazi collaborators as “freedom fighters.” Germany and the other EU nations abstained, the USA, Canada, and Ukraine voted against the document, with 115 nations voting in favor. Berlin and Brussels use the excuse of not wanting to support a resolution initiated by Russia. In fact, a vote in favor of the document would have caused hefty disputes within the EU, and between the EU and important allies. With growing frequency, notorious Nazi collaborators are being publicly honored in such EU countries as Hungary or the Baltic countries and in Ukraine, in some cases by officials of the respective governments. Last Friday, when the Third Committee of the UN General Assembly put the resolution to a vote, the German Ambassador to the UN found himself unable to cast his vote in favor. All other EU nations also abstained, along with countries, dependent, in one way or the other, on the EU, such as Andorra, Bosnia-Herzegovina or Mali. Ukraine, the United States, and Canada voted pointblank against the resolution. The latter two countries are sheltering rather influential Ukrainian exile communities, characterized by former Nazi collaborators of the “Organization of Ukrainian Nationalists” (OUN). The reason generally given last Friday was that they did not want to support a resolution initiated by Russia. The Soviet Union – of which Russia had been its core – was the country accounting for the most casualties from Nazi terror – 27 million. However, had Germany and the other EU nations voted in favor of the resolution, it would have necessarily caused hefty disputes. Today, collaborators, who had joined the Nazis in the war against Moscow, are commemorated in several European countries. This is particularly true of Ukraine, where, since early 2012, German organizations have been working – and intensively so, since 2013 – to incorporate the Svoboda Party and its affiliated forces into an anti-Russian alliance of organizations. (german-foreign-policy.com reported.) Svoboda honors the OUN and particularly its commander Stepan Bandera, who is very popular throughout West Ukraine. In 1941, Bandera’s militias actively supported Nazi Germany in its attack on the Soviet Union. Svoboda also honors the “Ukrainian Partisan Army” (UPA), which, in the wake of the German war of extermination, had participated in mass murders of European Jews. In the course of the Maidan protests, both this party and other fascist organizations, receiving vigorous support from Germany, were playing a growing role. Consequently, since the end of February, Svoboda has had several ministers in the Ukrainian putsch regime. Today, fascist battalions are among the most resolute combatants in East Ukraine’s civil war. Some of their commanders have been elected to parliament in the Verchovna Rada on electoral tickets of the parties forming the future government. At the beginning of the month, an activist of the fascist “Right Sector” and deputy commander of the fascist “Asov Battalion,” had been named police chief of the District of Kiev. In their struggle against Russia, Ukraine is uninhibitedly developing the traditions of its anti-Soviet Nazi collaboration – at the side of Germany. Nazi collaborators are also being honored in EU member countries, for example, in the Baltic nations. Regular commemoration honor parades for the Waffen SS, sponsored by their national Waffen SS veterans are organized in Estonia, Latvia, and Lithuania. In Latvia, one of the most recent marches was held last spring, with approx. 2,000 participants – which, in proportion to the size of the population, would correspond to a demonstration of 80,000 in Germany. Observers point out that in Riga’s state-run Latvian “Occupation Museum” the Latvian Waffen SS militias are referred to as “freedom fighters” in the struggle against Moscow. Organizers of the Waffen SS memorial march are invited to schools to teach courses in “patriotism.” The “All for Latvia” national alliance party, which has consistently been in the government since 2011, supports these memorial parades. The party recurringly raises the issue of the deportation (“repatriation”) of the country’s Russian-speaking minority. One of the party’s leaders had once declared that the Russian minority – nearly one quarter of the population – are “occupiers” or “illegal colonialists.” A critical appraisal of Nazi collaboration is not welcome in this country. As the historian Maris Ruks notes, Latvian scholars risk “setbacks in their careers, if they engage in too detailed research into the Holocaust.” In the current confrontation with Russia, the Baltic countries are among the EU’s most aggressive forces. Also in Hungary fascist traditions are becoming more prevalent. Showcase examples are the new memorials to the “Reich’s Deputy” and Nazi collaborator Miklós Horthy, which have been inaugurated since 2012. After changing the name “Freedom Square” to “Horthy Square,” in April 2012, in Gyömrö, near Budapest, a Horthy statue was erected in the village of Kereki in southern Hungary. A Horthy commemorative plaque was installed on its premises of the Calvinist College in Debrecen in May 2012. Other memorials have followed. For example, in June 2013 in the East Hungarian village of Hencida  and in November of the same year right in Budapest. “Hitler’s Hungarian partner is being rehabilitated,” wrote German press organs back in 2012, attentively noting that, at Hitler’s side, Horthy had led Hungary “into war against the Soviet Union.” However, currently, Hungary is not one of those countries taking a particularly aggressive stand toward Russia. The rehabilitation of Nazi collaborators extends far beyond Horthy. Since the 1990s, there have been many commemorative plaques dedicated to the ethnic, anti-Semitic writer, Albert Wass, who had been a loyal follower of Horthy and the Nazi Reich. His writings have been as accepted into the country’s curriculums as those of Jozsef Nyiro, who still in 1944 was active in the Nazi Arrow Cross Party. Hungary’s “Jobbik” Party – which polled 20.5 percent in the April 6, 2014 elections, its greatest success ever – stands in the tradition of the Arrow Cross Party. This is hardly an exhaustive list of EU countries publicly honoring Nazi collaborators. In Croatia, for example, monuments to Nazi opponents were destroyed, while, streets were being named after Mile Budak, the fascist Ustasha’s leading propagandist and, for awhile, Croatia’s Foreign Minister during the period of Nazi collaboration. In Italy’s Affile, to the east of Rome, a mausoleum to the fascist war criminal, Rodolfo Graziani was inaugurated in 2012. Graziani, who had initially been engaged in “counter insurgency” in Libya, ordered hostages shot and used poisoned gas in Ethiopia. Toward the end of the war, he was having Italians executed for refusing to collaborate with the Nazi puppet regime in Salò. Had Germany and the other EU countries not refused to vote in favor of last Friday’s UN resolution, they would – had they taken the document seriously – be facing serious conflicts with one another and with their close allies, e.g. their partners in Ukraine. United Nations General Assembly: Sixty-ninth session of the Third Committee. Agenda item 66 (a): Elimination of racism, racial discrimination, xenophobia and related intolerance. A/C.3/69/L.56/Rev.1. 19.11.2014. See A Broad-Based Anti-Russian Alliance, Termin beim Botschafter and Juschtschenkos Mythen. See Zwischen Moskau und Berlin (IV). See Tag der Kollaborateure and “Liberation Fighters” and “Occupier”. Frank Brendle: International gegen SS-Verherrlichung. www.neues-deutschland.de 17.03.2014. György Dalos: Horthy im Hoch. www.nzz.ch 03.07.2012. Jobbik und Neue Ungarische Garde weihen neues Horthy-Denkmal ein. pusztaranger.wordpress.com 23.06.2013. Paul Jandl: Hitlers ungarischer Partner wird rehabilitiert. www.welt.de 05.06.2012. 3. Fol­low­ing the anti-Russian “lus­tra­tion” laws, Petro Poroshenko is moving to alter the cit­i­zen­ship laws to allow select for­eign­ers to get fast-tracked cit­i­zen­ship in order to allow them to hold cab­i­net posi­tions. It sounds like he’s also con­sid­er­ing just allow­ing for­eign­ers to fill those posts with­out the cit­i­zen­ship require­ment. It sounds as if he wishes to install personnel from the OUN/B diaspora in Ukraine’s law enforcement and national security apparatus. “Poroshenko Wants to See For­eign­ers Head­ing ‘Ukraine’s FBI,’ Fill Cab­i­net Positions” by Katya Gorchinskaya; Kyiv Post; 11/27/2014. Pres­i­dent Petro Poroshenko asked the new par­lia­ment to amend leg­is­la­tion to allow for­eign­ers to take top jobs in the nation, includ­ing head of the Anti-Corruption Bureau. “I have a con­crete sug­ges­tion to all who is involved, accord­ing to pro­ce­dure spelled out in law, to the appoint­ment of this extremely impor­tant insti­tu­tion. I sug­gest invit­ing to this job a per­son from out­side of Ukraine,” Poroshenko told the new par­lia­ment on Thurs­day, the day of its opening. “Thus we will have an advan­tage – an absence of con­nec­tions in the Ukrain­ian polit­i­cal elite,” Poroshenko explained. The Anti-Corruption Bureau is yet to be cre­ated, and is sup­posed to fight top-level cor­rup­tion. It has already been dubbed “Ukraine’s FBI,” and the process of its cre­ation is closely watched by Ukraine’s for­eign cred­i­tors and local busi­ness community. More­over, Poroshenko said he wanted to amend the law to allow for­eign­ers to take other top jobs, or sim­plify the pro­ce­dure for grant­ing Ukrain­ian cit­i­zen­ship to foreigners. “My idea is, by chang­ing the law, to allow for­eign­ers into state ser­vice, includ­ing gov­ern­ment seats, or extend the list of per­sons the pres­i­dent can grant Ukrain­ian cit­i­zen­ship, through fast track­ing,” Poroshenko said. Poroshenko’s admin­is­tra­tion hired an inter­na­tional recruit­ing com­pany, Korn Ferry, and its local branch WE Part­ners, to iden­tify can­di­dates for the next gov­ern­ment. They approached for­eign­ers in Ukraine and abroad. They are Amer­i­can, Lithuan­ian and Geor­gian nation­als, accord­ing to Insider.ua, a Ukrain­ian site that spe­cial­izes in polit­i­cal news. Cur­rently, the law has a lim­ited list of rea­sons to gain Ukrain­ian cit­i­zen­ship. It can hap­pen through birth, adop­tion or in cases when at least of the par­ents has such cit­i­zen­ship. For­eign­ers wish­ing to gain Ukrain­ian cit­i­zen­ship have to give up their orig­i­nal passports. Poroshenko implied in his speech that there may be peo­ple who are pre­pared to con­sider such an option. “The deci­sive steps of such for­eign­ers, which will be pre­pared to turn down their own cit­i­zen­ship and accept a Ukrain­ian cit­i­zen­ship, will be a con­fir­ma­tion of their deci­sive­ness of the inten­tions of our poten­tial part­ners and can­di­dates,” he said. “Ukraine’s Made-in-USA Finance Min­is­ter” by Robert Parry; Con­sor­tium News; 12/5/2014. A top prob­lem of Ukraine has been cor­rup­tion and crony­ism, so it may raise eye­brows that new Finance Min­is­ter Natalie Jaresko, an ex-U.S. diplo­mat and newly minted Ukrain­ian cit­i­zen, was involved in insider deal­ings while man­ag­ing a $150 mil­lion U.S. AID-backed invest­ment fund, writes Robert Parry. Ukraine’s new Finance Min­is­ter Natalie Jaresko, a for­mer U.S. State Depart­ment offi­cer who was granted Ukrain­ian cit­i­zen­ship only this week, headed a U.S. government-funded invest­ment project for Ukraine that involved sub­stan­tial insider deal­ings, includ­ing $1 million-plus fees to a man­age­ment com­pany that she also con­trolled. Jaresco served as pres­i­dent and chief exec­u­tive offi­cer of West­ern NIS Enter­prise Fund (WNISEF), which was cre­ated by the U.S. Agency for Inter­na­tional Devel­op­ment (U.S. AID) with $150 mil­lion to spur busi­ness activ­ity in Ukraine. She also was cofounder and man­ag­ing part­ner of Hori­zon Cap­i­tal which man­aged WNISEF’s invest­ments at a rate of 2 to 2.5 per­cent of com­mit­ted cap­i­tal, fees exceed­ing $1 mil­lion in recent years, accord­ing to WNISEF’s 2012 annual report. The growth of that insider deal­ing at the U.S.-taxpayer-funded WNISEF is fur­ther under­scored by the num­ber of para­graphs com­mit­ted to list­ing the “related party trans­ac­tions,” i.e., poten­tial con­flicts of inter­est, between an early annual report from 2003and the one a decade later. While the ulti­mate suc­cess of that U.S.-funded endeavor may still be unknown, it is clear that the U.S. AID money did “kick-start” Jaresko’s career in equity invest­ments and put her on the path that has now taken her to the job of Ukraine’s new finance min­is­ter. Ukrain­ian Pres­i­dent Petro Poroshenko cited her expe­ri­ence in these invest­ment fields to explain his unusual deci­sion to bring in an Amer­i­can to run Ukraine’s finances and grant her citizenship. Jaresco served as president and chief executive officer of Western NIS Enterprise Fund (WNISEF), which was created by the U.S. Agency for International Development (U.S. AID) with $150 million to spur business activity in Ukraine. She also was cofounder and managing partner of Horizon Capital which managed WNISEF’s investments at a rate of 2 to 2.5 percent of committed capital, fees exceeding $1 million in recent years, according to WNISEF’s 2012 annual report. While the ultimate success of that U.S.-funded endeavor may still be unknown, it is clear that the U.S. AID money did “kick-start” Jaresco’s career in equity investments and put her on the path that has now taken her to the job of Ukraine’s new finance minister. Ukrainian President Petro Poroshenko cited her experience in these investment fields to explain his unusual decision to bring in an American to run Ukraine’s finances and grant her citizenship. With an American former private equity fund manager now Ukraine’s Minister of Finance, you have to wonder what’s next for the country. Hmmmm….. The new finance minister of Ukraine, Natalie Jaresko, may have replaced her US citizenship with Ukrainian at the start of this week, but her employer continued to be the US Government, long after she claims she left the State Department. US court and other records reveal that Jaresko has been the co-owner of a management company and Ukrainian investment funds registered in the state of Delaware, dependent for her salary and for investment funds on a $150 million grant from the US Agency for International Development. The US records reveal that according to Jaresko’s former husband, she is culpable in financial misconduct. Jaresko was appointed on Monday, and approved by a vote of the Verkhovna Rada on Tuesday evening. A presidential tweet and an announcement from the office of President Petro Poroshenko say a decree has been signed granting Jaresko Ukrainian citizenship to qualify her to take office. The legality of the decree was challenged today by the head of Poroshenko’s bloc in parliament, Yury Lutsenko. For the record of Jaresko’s predecessor at the Finance Ministry in Kiev, Alexander Shlapak, click. Jaresko was born into the Ukrainian émigré community of Chicago, taking her name from her father John Jaresko. Her brother, also named John, has been active in Ukrainian movements and received a medal in 2010 from then President Victor Yushchenko. At the time, sister Natalie was an appointee of Yushchenko’s Foreign Investors Advisory Council and the Advisory Board of the Ukrainian Center for Promotion of Foreign Investment. Yushchenko had given her the St. Olga medal in 2003. Older sister, Katherine, married a Ukrainian, as did Natalie, who is 49. In 1989 Natalie Jaresko married Ihor Figlus, and took his name until their marriage ended in divorce in 2010. For a study of the influence in Kiev of Kateryna Chumachenko and other Ukrainian-American women employed by the State Department, including Jaresko, read this. Chumachenko (below 2nd from left, with President George Bush in 2005) is the second wife of Victor Yushchenko, the Ukrainian President between 2005 and 2010. Even with Yanukovych gone, corruption is a problem that still plagues the country. External threats to Ukraine from Russia have dominated the news for months, but as that situation starts to stabilize the country will need to confront an old, internal enemy: corruption. Transparency International ranks Ukraine 144 out of 177 countries on its corruption-perception index. Corruption was at the heart of popular discontent with the deposed regime of Viktor Yanukovych, and widespread graft helps explain why the economy stalled in 2012 and 2013. Kiev must tackle this problem urgently, even as its leaders confront Russia’s territorial ambitions. The scale of the graft under the previous administration, if the allegations turn out to be true, is breathtaking. Prime Minister Arseniy Yatsenyuk has accused the Yanukovych regime of stealing $37 billion from the state—equal to one-fifth of Ukraine’s GDP in 2013—during its four years in power. This corruption is said to have taken several forms. The Yanukovych administration was allegedly able to buy natural gas at low, state-controlled prices and then resell it at market prices that could be as much as eight times higher. Volodymyr Groysman, Ukraine’s current deputy prime minister, has said that gas worth $2.5 billion was sold this way. Infrastructure projects have also come under suspicion. In August 2008, for example, the city of Lviv was accepting tenders for a football stadium to host the 2012 European championships. Alpine, an Austrian company, placed a bid at $191 million, according to company records, but it was rejected since the request was for proposals of up to $116 million. In the end, the construction of the stadium was awarded to Donetsk-based Altkom, according to the Ukrainska Pravda. The total cost came in at $370 million, according to government documents. The European Investment Bank, which had intended to contribute to the financing of the stadium, withdrew in protest. Cleansing Ukraine of its corruption will require several interrelated measures. In this regard, Estonia and Georgia have shown the way. To begin with, the state needs to limit its regulatory role by abolishing or merging many state agencies. Minimizing state interference in the economy—whether by privatizing state-owned assets or cutting regulations—reduces opportunities for corruption in the first place. The government should also cut public expenditures, and corrupted subsidies must be eliminated. The deregulation of gas and electricity prices in this case must be seen as a matter of combating corruption, not as a social issue. The poor can be given targeted cash compensation instead. The tax system also needs to be simplified and the tax police abolished, to shield taxpayers from lawless persecution. Ukraine has recently adopted a law on public procurement requiring open public tenders, and voters should demand their leaders follow that law to the letter. Officials also must focus on delivering reliable rule of law. This should entail the creation of an independent commission scrutinizing all the top judges and prosecutors in Ukraine and dismissing those found to have engaged in graft. By signing the Association Agreement with the European Union, Ukraine has committed itself to adopting hundreds of reform laws, while the EU has committed itself to providing substantial technical assistance in drawing up new laws and reorganizing state agencies. That deal is on hold for now, but Brussels and Kiev can still find ways to move forward. Those parts of the agreement that target corruption, for example, should be a priority; as should building a strong and independent judicial system. The Ukrainian people have made a choice for Europe. If they stick with it and pursue reform with determination, they will have their best chance to clean out the Augean stables of a long-corrupt system. Mr. Åslund is a senior fellow at the Peterson Institute for International Economics and author of “How Ukraine Became a Market Economy and Democracy” (Peterson Institute, 2009). This article, adapted from a longer essay that appeared in the Journal of Democracy, is the second of a Journal series of two features on the Ukrainian economy. Natalie Jaresco isn’t part of the Peterson Institute, but it’s pretty clear that’s she’s fellow travelor given that the Petetrson Institute is basically a mouthpiece for the international oligarchs that want to see a world run by finance and billionaires. So it’s going to be important to keep in mind that gutting the Ukrainian public sector, slashing public spending, deregulating business, and generally selling off the state assets to the oligarchs and international investors is probably going to be the template for the official “anti-corruption” campaigns going forard. Are corrupt oligarchs corrupting your government? Why not sell off state assets to them to end the corruption. (Reuters) – The Ukrainian government has drafted a law that paves the way for the privatization of hundreds of state-owned companies previously considered strategic, Kommersant-Ukraine newspaper reported on Wednesday citing a leaked draft document. Ukrainian Economy Minister Petro Poroshenko said this week the government planned to remove about 1,200 enterprises from the list of strategic assets that cannot be privatized, Ukrainian media reported, but did not name any. According to Kommersant, the draft law lifts the ban on privatizing numerous coal mines, oil and gas pipelines, grain silos and other industrial assets. The sell-off could provide extra budget revenues for the cash-strapped former Soviet republic and also harks back to 1990s moves that freed up business and drove development of the European Union’s eastern member states. “Should the new list pass through the Rada (parliament), it might pave the way for a new round of massive privatization in Ukraine,” VTB Capital said in a note on Wednesday. But, since President Viktor Yanukovich’s election in early 2010, many privatization auctions have been won by his campaign’s main financial backers, industrialists Rinat Akhmetov and Dmytro Firtash. Companies close to Akhmetov, in particular, have purchased stakes in a number of electric power companies while Firtash’s group has won most auctions for regional gas distribution companies. “…Examples of privatization in Ukraine suggest that such (transparent and competitive) conditions are not always met in a way that maximizes the benefits for the state,” VTB Capital said. “…Examples of privatization in Ukraine suggest that such (transparent and competitive) conditions are not always met in a way that maximizes the benefits for the state”. Better luck this time! The International Monetary Fund has identified a $15bn shortfall in its bailout for war-torn Ukraine and warned western governments the gap will need to be filled within weeks to avoid financial collapse. The IMF’s calculations lay bare the perilous state of Ukraine’s economy and hint at the financial burden of propping up Kiev as it battles Russian-backed separatist rebels in its eastern regions. The additional cash needed would come on top of the $17bn IMF rescue announced in April and due to last until 2016. Senior western officials involved in the talks said there is only tepid support for such a sizeable increase at a time Kiev has dragged its feet over the economic and administrative reforms required by the programme. Without additional aid, Kiev would have to massively slash its budget or be forced to default on its sovereign debt obligations. Since the bailout programme began in April, Ukraine has received $8.2bn in funding from the IMF and other international creditors. Pierre Moscovici, the EU economics chief, said the European Commission was weighing a third rescue programme on top of the €1.6bn ($2bn) it has already committed to Kiev; the Ukrainian government has requested an additional €2bn from Brussels. But Pier Carlo Padoan, the Italian finance minister who chaired a discussion of Ukraine’s financial situation at a meeting of his EU counterparts on Tuesday, said EU resources should only be mobilised if Kiev made a “stronger effort” towards implementing reforms. At a meeting of his cabinet in Kiev, Ukraine’s prime minister, Arseniy Yatseniuk, insisted his government was prepared to put in place unpopular measures, including deep cuts in spending, a crackdown on the massive shadow economy and moves to deregulate the country’s uncompetitive economy. Under IMF rules, the fund cannot distribute aid unless it has certainty a donor country can meet its financing obligations for the next 12 months, meaning the fund is unlikely to be able to send any additional cash to Kiev until the $15bn gap is closed. The scale of the problem became clearer last week after Ukraine’s central bank revealed its foreign currency reserves had dropped from $16.3bn in May to just $9bn in November. The data also showed the value of its gold reserves had dropped by nearly half over the same period. A person with direct knowledge of the central bank’s policy said part of the drop had been due to large-scale gold sales. According to two people who attended the EU meeting, concern over Ukrainian finances has become so severe that Wolfgang Schäuble, the German finance minister, said he had called his Russian counterpart, Anton Siluanov, to ask him to roll over a $3bn loan the Kremlin made to Kiev last year. George Osborne, the UK finance minister, expressed surprise at the request, attendees said, saying the EU was now asking for help from Russia at the same time it was sanctioning the Kremlin for its actions in Ukraine. So Ukraine can’t even get an additional loan from the EU? Oh right. Priorities. KIEV (Reuters) – Ukraine’s defense minister called on Friday for a doubling of the military budget next year to allow the army to buy weapons abroad and better equip itself to fight Russian-backed separatists in the east. Numbers of soldiers serving in the east, where government forces have been battling separatists since April, would also be increased to a quarter of a million next year from 232,000 currently, the minister, Stepan Poltorak, told parliament. Poltorak said the armed forces planned to spend about $110 million on buying new weapons abroad next year in addition to $365 million spent on domestic arms procurements. Ukrainian Prime Minister Arseniy Yatsenyuk told the parliament on Thursday that Ukraine, which has sought foreign help to avoid default, has to increase defense expenditure at the expense of social payments. He did not specify which countries Ukraine was eying for financial help. NATO countries have so far been reluctant to arm non-member Ukraine against the well-equipped rebels in order to avoid antagonizing Russia. But NATO members, the United States, Canada and Poland, have provided non-lethal aid. Ukraine would also shift some of its military units closer to Moldova, its south-western neighbor, because of what it saw as a threat from Moldova’s pro-Russian breakaway region of Transdniestria, Poltorak said. “We are facing the threat from our eastern border. But there is also a threat from Transdniestria and from the south and the quantity of our units there will be increased,” he said. Wait, so is Kiev now planning on thwarting an invasion from Transdniestria? That’s not going to be cheap. Sorry pensioners. Budapest – In what must rank as one of the most unlikely political comebacks of the century, the descendants of the last Habsburg emperor are once again making their mark in the Central European territories that their family ruled for hundreds of years. Not surprisingly, the comeback revolves around the cities of Vienna and Budapest, the twin centres of power in the latter years of the Austro- Hungarian empire, which at its peak stretched from the Adriatic to what is now Ukraine. The most striking example of the trend is the appointment this week of Georg von Habsburg, the 32-year-old grandson of Emperor Karl I, to the position of Hungary’s ambassador for European Integration. In neighbouring Austria, the traditional heart of Habsburg power, Georg’s brother, Karl, 35, was recently elected to represent the country in the European parliament. In addition to this, he serves as the president of the Austrian branch of the Pan-European movement. The appointment in Budapest, where Karl I and his more famous predecessor, Franz Josef I, both held the title King of Hungary, marks the first time that a Habsburg has been given any official post in that country since the collapse of the Austro-Hungarian empire in 1918 following defeat in the First World War. In addition to coming as a surprise, the move is full of historical irony. While Georg von Habsburg’s predecessors did all that they could to keep the clock turned back to an imperial past, he is now being asked to help propel the country into the future through integration with Western Europe. The new ambassador, who holds Hungarian citizenship and has worked as director of a film company in Budapest since 1993, was quick to deny that he saw his new job as a stepping stone to the restoration of the monarchy. Otto von Habsburg, 83, himself a keen advocate of the Hungarian cause, has long since renounced any claim to his father’s throne. But the same is not true of all the members of the family. Before his election to the European parliament in October, Georg von Habsburg’s older brother, Karl, refused to be drawn when he was quizzed on the issue. GEORGIA struggles to make its case in Germany, which sees trade ties with Russia as vital and the ex-Soviet Caucasian republic as troublesome. So who better to burnish Georgia’s image there than a German-educated Habsburg? Georgia’s new ambassador to Berlin, once she presents her credentials to the president next month, will be Gabriela Maria Charlotte Felicitas Elisabeth Antonia von Habsburg-Lothringen, princess Imperial and Archduchess of Austria, Princess Royal of Hungary and Bohemia. A name like that, says Georgia’s president Mikheil Saakashvili, should open doors. The towering figure on the Berlin diplomatic scene is the Russian ambassador to Germany, Vladimir Kotenev, an indefatigable socialite who runs what is probably the biggest embassy in Europe. Ms von Habsburg (the name she prefers) will not, despite her titles, have the cash to match his efforts. But she may still help Germans think again about Georgia’s European roots and future. Born in Luxembourg, brought up in Germany and Austria, the polyglot Ms von Habsburg is an avant-garde sculptor, specialising in large steel outdoor works. She has lived in Georgia since 2001, has become a Georgian citizen and gained a command of the language (it is “improving every day”, says Mr Saakashvili). By the standards of her family, a spot of diplomacy in Berlin is not particularly exotic. The heirs to the Habsburg emperors helped speed the downfall of the Soviet empire, particularly by arranging the cross-border exodus from Hungary to Austria in the summer of 1989 that punched the first big hole in the iron curtain. Among Ms von Habsburg’s six siblings, her younger sister Walburga is a leading conservative politician in Sweden; her brother Georg is an ambassador-at-large for Hungary. Another used to be in the European Parliament. Despite his easy manner, however, von Habsburg evidently has no intention of letting the past, particularly his ancestors’ role, remain lifeless in history books. Nearly a century after the Habsburg monarchy’s rule ended in Europe, he is dedicating himself to ensure its legacy lives on in western Ukraine. The 49-year-old von Habsburg was in Lviv in March to announce the creation of a foundation that carries his family’s name. Based in Ivano-Frankivsk, the Habsburg Foundation will promote and preserve the cultural legacy that for centuries shaped and gave Central and Eastern Europe its identity. Along with translating books about the Habsburgs, the foundation is also planning to create the Halychyna Award, a prize that will honor individuals who promote the region’s culture through art, books or media. While the foundation is still in its infancy, von Habsburg says its mission is vital. “In this area, we need to do something about keeping the heritage alive, the history and the intellectual history. Authors came here because they got their inspiration here,” he told the Kyiv Post in an interview. At the turn of the twentieth century, the Austro-Hungarian Empire – which gave Central and Eastern Europe much of its art, culture and architecture – spanned from Ukraine’s Carpathian Mountains, down to the Adriatic Sea in the south. It encompassed more that twelve European peoples and its monarchy, the Habsburgs, had enjoyed over six centuries of uninterrupted power. A recent book by renowned historian Timothy Snyder chronicles the life of Wilhelm von Habsburg, the member of the Habsburg family who was closest aligned with Ukrainians. Titled The Red Prince, it brought renewed attention to the family’s connections with the region. Better known as Vasyl Vashyvaniy, Wilhelm was the younger son of Archduke Karl Stephan, who was in line to eventually become King of Poland. In a bid to save his crumbling world, in 1916, Emperor Franz Josef I, along with his German counterpart, had created a Polish kingdom as an independent state with a hereditary monarchy. Wilhelm, however, had his own goal: He wanted to establish a monarchy on the territory of what is today’s western Ukraine. Snyder writes that the idea was well-received, particularly among some Ukrainian military leaders and the Church. A military officer by training, Wilhelm supported Ukraine’s independence struggle during World War I. He fought with Ukrainian troops against the Russians, and had schemed and cajoled a myriad of politicians to support his monarchial aspirations. Almost until his death at the hands of the Soviets in 1948 – he was snatched off the streets of Vienna and transported to a prison in Kyiv for working as an agent against the Soviet Union – Wilhelm believed this slice of the family’s empire could be his. Although Wilhelm remains a lesser known figure in history books, von Hapsburg said he is aware of the role he played both within the family’s and Ukraine’s history. The Habsburg era has undergone somewhat of a renaissance lately in western Ukraine; the new foundation is just the latest in that trend. A conference held late last year brought scholars from around the country to Chernivtsi, which along with Lviv was considered an important city in the region. A Ukrainian-language book on Wilhelm titled The Ukrainian Patriot from the Habsburg Dynasty was published in 2008. It outlines not only his biography, but also contains archival documents and Wilhelm’s correspondence with Ukrainian military and religious leaders. Yet as much as his family’s legacy may be making a comeback in Ukraine, the Habsburgs have had a harder time in Austria, von Habsburg said. Otto was only allowed to return to Austria in the early 1960s after renouncing claims to the throne. Still, von Habsburg and his relatives remain politically active. Von Habsburg was once a member of the European parliament, while others currently hold posts there. One relative even became a citizen of Georgia and is her new country’s ambassador in Germany. “It’s a family that hasn’t focused on just one part of the world,” von Habsburg said. “It’s a family that hasn’t focused on just one part of the world,” von Habsburg said. LOL! Yeah, that’s certainly true. Especially for Karl. “I have a family link to Ukraine, because part of Ukraine was very closely linked to Austria not that long ago. I think that radio is a very interesting media, with the possibility to reach a lot of people in an immediate way. So it is of personal interest to me that I have the chance to continue being active in Ukraine.” Yep.